Lok is a desert planet in the Mid Rim. 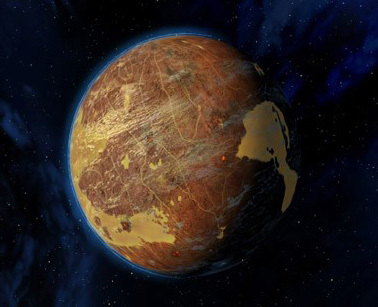 It is not far from Tatooine and Geonosis and has very similar climate and terrain. It is also only a short distance to Naboo and Ryloth. One of the first planets in the Karthakk system to be colonized, the harsh world of Lok was originally home to outlaws, who saw the world as a potential staging ground for raids into the Mid Rim. Over time, Lok became known as a "pirate world," where anarchy and violence were the only constants. Lok has fairly varied terrain, ranging from the dangerous sulfur pools, lifeless rivers and volcanoes, to the bubbling lava pits that were all commonly found on the planet. The landscapes are generally foreboding: jagged mountain ranges, long expanses of baked desert, and desolate flats are typical environments on Lok. The presence of pirates and others is evident in the shipwrecks, burned-out bases, abandoned settlements, and destroyed vehicles that litter the planet. An anomaly on the planet Lok was the mysterious 'Great Maze of Lok'. It was a square maze with several entrances, with a small oasis in the middle. Settlers on the planet had no idea when it was built or why. Lok was also the home of the Kimogila creature. Before the Battle of Naboo, one of the most prominent leaders on Lok was a Feeorin pirate named Nym. Nym lived on Lok as a child. He was a warlord during years leading up to the Clone Wars and founded a pirate group known as the Lok Revenants. They attacked ships coming and leaving the planet until Nym declared war against the Trade Federation, which later occupied the planet. The hardy alien - who has only become more formidable with age - spent many years battling the Trade Federation. After ten years, the Lok Revenants reclaimed the planet. It was also rumored that Nym was very sympathetic to the Rebellion. There is only one settlement during the time of the Empire. Around 137 years after the Battle of Yavin, Lok was home to a cantina called Brogar's which served as a safe-house for various fugitives. It was there that Cade Skywalker captured gambler Naxy Screeger and Jedi Hosk Trey'lis.